Shoreditch College --- Lost Touch? I will include the request in the next revision of this page. Don't forget to look at the News and Views Page � you will find letters on various subjects there. My name is Caroline Richards and I'm trying to trace a Billy G.E.R. Lyel who was a student at Ditch 1956 ish but national service might have meant he didn't start until 59 as he went into the RAF. He was from Launceston in Cornwall and studied to be a woodwork teacher. He was my Dad's best friend from school but lost touch after school as they went their separate ways. It is my dads eightieth birthday soon and thought it would be nice if I could track Billy down. Ironically I am also an ex shoreditch student although it was Brunel by then. I was there 83-87. I appreciate that Billy may have passed away but if you can come up with any information I would be grateful. I see his name on the valete list for 1960. I was at Shoreditch Training College, Englefield Green, Egham from 1953-55. Please can you see if these two guys are still breathing & upright. 2) Henry Richards from west Cornwall whose dad was a Cabinet maker. Henry probably became one late in life, he was brilliant working wood ie Rosewood particularly. Like many others, we were 75yr but did BEd leaving 76. Love to make contact with anyone but specifically Paul Goodliffe as he was the usher at our wedding and we�re celebrating 40 years this year. We now live in Byron Bay Australia. John Harrison and Jill Parsons. I am trying to connect with 2 people. 2) Ursula Kennedy who was in my year and left in 1974. Ursula came from Tilehurst, near Reading. I have had no contact with either since I left but would love to know what has happened to them over the years and to be able to contact them again would be incredible. Hope you may be able to help. I was at STC for 18 months 1964/66 before leaving for personal reasons. If possible I would like to get in touch with BARRY ERIC CLAY who graduated in 1967. I have never known his address. My name is Ray Dowdall, 16 Calcaria Crescent, Tadcaster, North Yorkshire, LS24 9LN. If anyone can supply me with any information I would be very grateful. 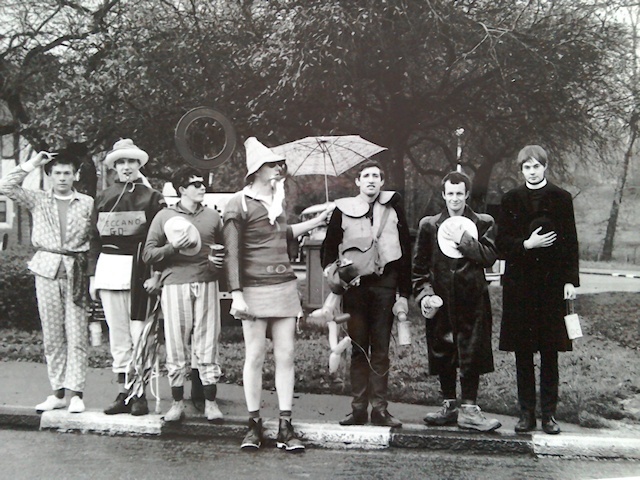 I have come across some of my college pictures. 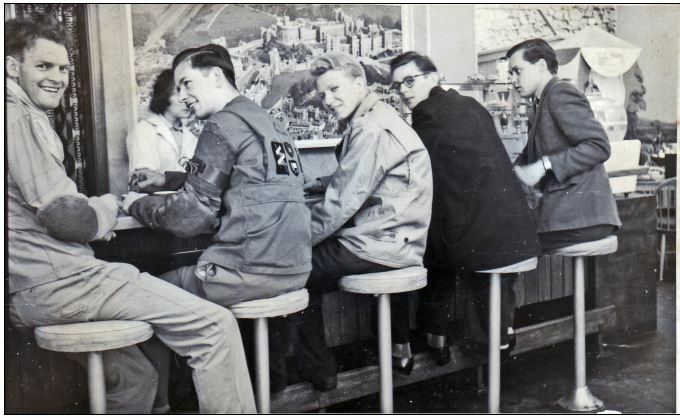 Hugh Frostick is writing a biography of Ralph Rutherford, who was at the college in 1953-55 after leaving the RAF as a jet fighter pilot (he wrote an article for the college magazine about his flying days). Ralph kindly provided some photos, which you can see here. Ralph would love to get in touch with fellow students Charlie Stobbs from Wales, Henry Richards a cabinet maker in Cornwall and Tim Yeo also in Cornwall - they can contact him via Hugh at this email address: hfrostick@gmail.com. Ralph would also love to see a copy of that article if anyone happens to have kept the magazine. I was on the one year course 1968 to 1969 and have attached the pass list from my year. I would love to hear from any of them, however I know Syd Boothroyd has passed away. I went on to teach in Luton at a secondary for for years, and then went into FE/HE in construction education, becoming HOD of construction at City College Norwich. I am now retired and living near Norwich. Does anyone have any information, or to have witnessed the band Queen playing a concert at the Shoreditch College of Education in December 1970, or at any other time that I don�t know about? Please contact Gary at garytaylortqy@aol.com or 07944435883. Dave Webster, Steve Towler and Ken Humpherson from my year. If you have their contact details I would be very grateful. - Freeman of the Worshipful Company of Turners and a member of the Howe committee. Great to see the Ditch website is up and running again. Well done! Attached is a photo of a small group of us from 68 year having lunch in Marlow. From the left going clockwise --- Barry (Moo) Taylor, Viv Williams, Bob (Hank) Woolridge, John (Sandy) Saunders, Tim Watson. 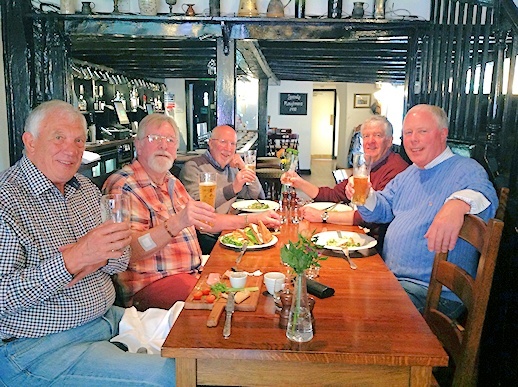 We meet up once a year or so for lunch and would welcome anyone from 68 year who would like to join us. Probably the easiest contact is myself at timbertim21@gmail.com . 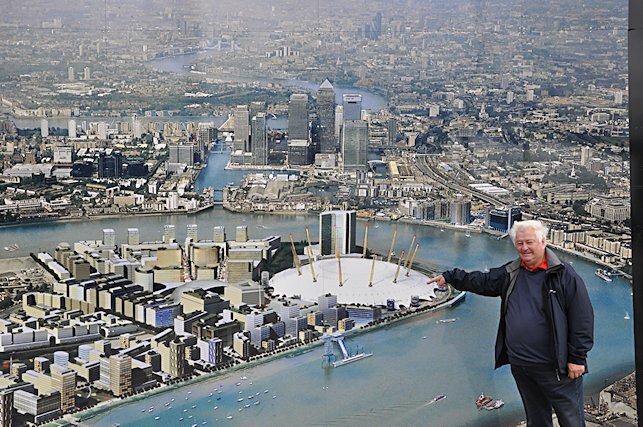 My name is Philip Shirtcliff and I was at Shoreditch College from 1955 � 1958, and I would love to get back in touch with some of my old friends from then. I already know about Reg Stoker, Alan Quartermain, Chris Perfect and John Risbrook(whom I still see quite regularly). Old friends that come to mind are: Bob Squance, Gordon Senior. And I am sure I shall be able to think of others. The other matter that I am very keen to acquire are copies of the old end of year magazines called, I think, �Column�. I have one for 1956/57. But would like those for 1955/56 and 1957/58. Are you able to help in either of these matters? I would be most grateful if you can, or put me in touch with any old student who could. As curate at Egham Parish Church at that time, I met a student named John. My only recollections are that he lived in Cornwall and came to our church, but I would now like to be in touch with him. I know this is a �long shot �, but thought I would ask. I was at Shoreditch from 1964 to 1967, and as it is coming up to fifty years since I left, I thought it about time that I tried to make contact with anyone who remembers me. My name is John Smith although I am possibly better remembered as JD. I was in group 10 of that year; served on the social committee; was on the carnival committee and was a founding member of the Meccano club. It would be good to hear from anyone who was in that '67 year, but especially other members of the Meccano club. I understand from the college website that you are trying to compile a directory of past students and staff, and I would be very happy to provide my details if you are continuing with this project. Looking forward to hearing from you, and hopefully some old friends. The photo actually appeared on the front page of a local newspaper, with a brief account of other activities during Carnival week. Are you able to put the photo on the Shoreditch website to jog people's memories? I would be more than happy for you to do so, if possible. Hi, just found this site and touching base. Pleased to hear from anyone who might remember me (rag committee 68, soc sec 69-70). I moved in to special ed after probationary year in secondary but after 25 yrs finally escaped in 96 to work as music tutor and musician with steelbands in the north east, more or less retired now but can't resist doing little bits of work (play?). I attended the college until 1979 as a trainee PE teacher. There were only about 15 of us, I would love to get back in touch with any of them. One of the only guys whom I can remember including surname was Richard Tidy. There was a Roy, Nick, Sharon and Teresa among others. If you have any information that might help me contact them, I would be very grateful. I am making contact in memory of Kenneth J Ledbury who sadly passed away in December 2007. He was a Student at the College from 1956 to 1958. 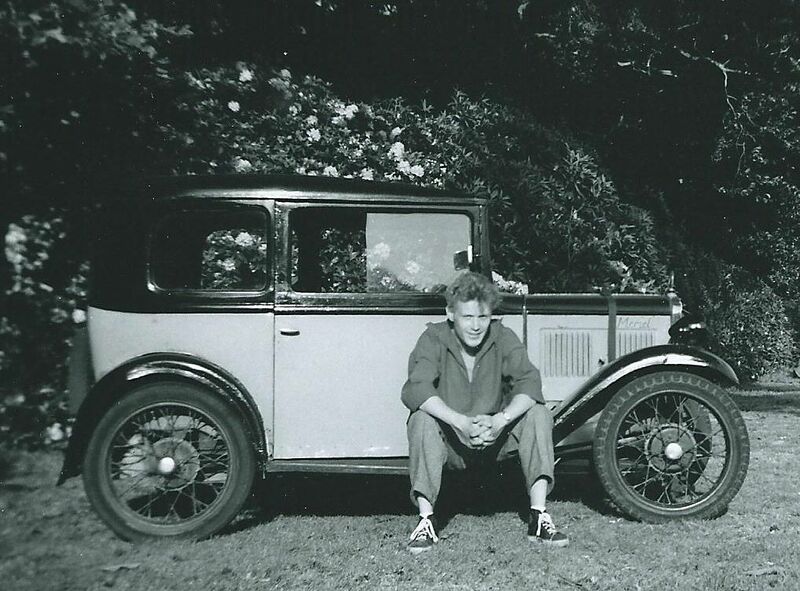 I am including photo of the First Year of 1957, Article about The Stompers from The Column Magazine 1957, and photo of Kenneth with his Austin 7 named Meriel which was no longer in his ownership by the end of 1958. Would be interested to hear from anyone who has memories of Kenneth, in particular photos or memories that they wish to share of The Stompers when he was their Washboard Player. Also, does anyone remember what happened to Meriel, or have any photos showing the number plate, wonder if she is still around or on the road. I am Peter Burrows, 1966 year. I was Secretary and President of The Shoreditch Society; formerly Shoreditch College Club in the 70's and 80's. I am writing a sort of autobiography and wonder if you can give me some more precise details than my memory can recall. 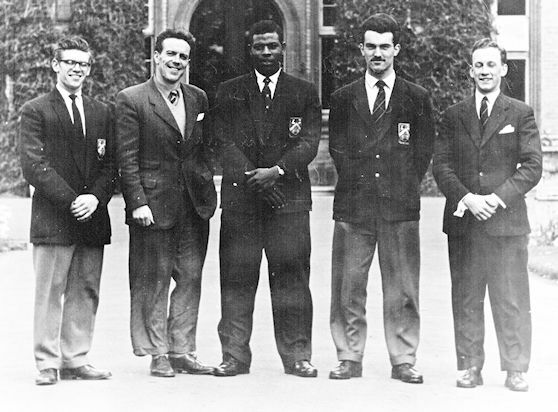 The 1966 year may be distinguished in that we never had a 'Exhibition' which was usually quite a grand affair when final year men's work was displayed in the hall and the College was open to visitors. The College Club usually held their AGM on the Sunday. Shortly after our final examinations were complete and after the famous final job night was over in May 1966 there was a serious outbreak of Salmonella food poisoning. Several men were hospitalised and I remember the night patrols of the corridors checking for men collapsed in their rooms. On the morning after, the College closed and we all went home. Apparently the cause was a carrier, a cook. Do you have any record of this? Thank you for all your efforts keeping the Shoreditch name going. I often wonder how much more successful the Shoreditch Society would have been if we had had e-mail in the 70's when everything was done by Gestetner and Royal Mail! The just discovered College website, coupled with my attempts to find the entrance off Coopers Hill yesterday as I wandered over the Green prompted me to search on line. Wife and daughter, who is in her final year reading history at Royal Holloway, finished lunch at the Barley Mow while I walked the dog down memory lane looking for clues to my past! So much of my life was shaped by Shoreditch and many of the tutors from my great two years there have left their stamp on my life. So first a heartfelt thank you to your Father's memory. He once said, 'Gentlemen, if you have a craft, you are saved'. he was spot on for me. I met my first wife when she was at Holloway when I was able to provide transport to our mutual friends with my old Jag convertible. She and I parted after many years and while working in education, I met my second wife and it is our daughter who chose Holloway from her list of country wide uni's with I hope, no influence from me and now she too is just about to sit her finals in History. Mr Tuckett convinced me I could paint, Mr Adams gave me a lifelong love of pottery - some made with him is still here in one piece! This is enough history for you yet it is lovely to acknowledge that my life owes so much to your father Mr Williams and the other tutors who certainly 'lit my fuse'! Trying to contact: Tony Martin, Brian McCormack, David Lee, Leslie Mathias, Brian Jenkins, I know where he is. I qualified in 1960 but stayed on for an extra year. Claim to fame was an extra in the French Mistress singing with others the French national anthem. Started at college in black military style huts near the chapel. Moved to main building and in digs in Englefield Green. Excellent college. 42 years teaching now retired touring with my coachman caravan and my Saab 95 aero car. Wood turning in my workshop to keep my brain working. A recent picture of me. I should love to be in contact again with John Harding, a brilliant teacher who did his final teaching practice at Horsenden Secondary Boys' School in Greenford, Middlesex where I, at that time, was Head of History. He was a collector of Chelsea porcelain. 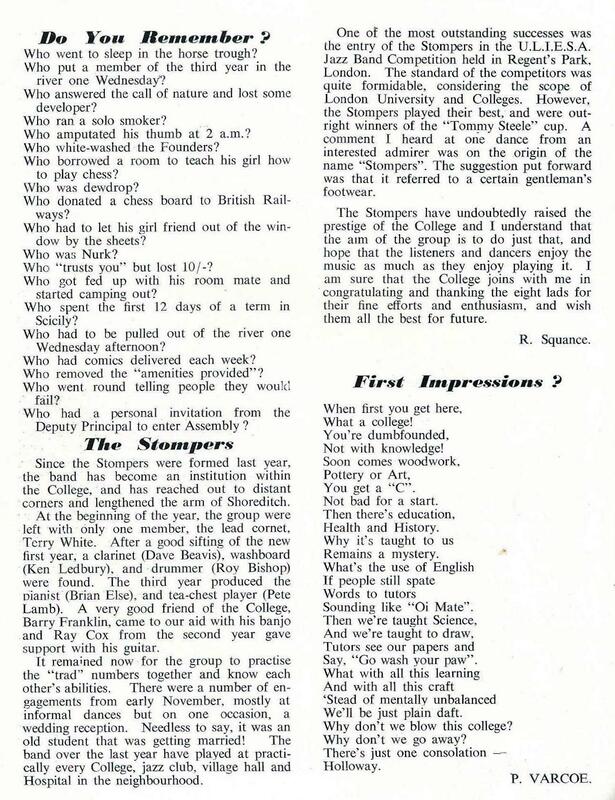 I was very pleased to discover the existence of the STC web page as I have had little or no contact with the College or friends since leaving in July 1946. This is not surprising in view of the College's relocation and my own 'call up' a few weeks after leaving. I much regret this and will try to catch up. I do not know who of my year group are left as most must also be well past their 'sell by' date. Perhaps some will remember my production of Cinderella in the main hall and/or a two piano performance with Frank Brereton of Grieg's Piano Concerto also in the Great Hall. I have a printed programme of the former and also several copies of 'The Column' which could be passed into the Archives - if wanted. I wil append or list those in my year group most of whom I remember well. Following two years service in the Royal Army Education Corps and having been trained as a Secondary School Handicrafts Teacher I was on demobilisation posted to a Junior School by Essex Education Dept. to whom I was contractually bound. There I spent the next 17 years becoming much involved in music education until when about to accept a Headship I was invited to become Music Adviser in the newly formed London Borough of Redbridge - a position I finally accepted. Later I was awarded both the Queen's Jubilee Medal and an OBE in 1978. Although I had perhaps not made the best use of my craft training being originally the student 'most unlikely to succeed' I feel I can be proud of my years at Shoreditch. I would love to hear of others success. The craft team Messrs. Williams, Giles and Lumley taught me all I know and are remembered with respect and affection. How I ever made it - I shall never know!! I have been sorting out goodness knows how many old photographs and memorabilia, including a few old pictures taken at Shoreditch. I attach a picture taken in 1959/60 of a few members of the college rifle club. We used to shoot at Windsor Rifle Club range, and later would meet at a coffee bar in the town. I have managed to locate John Pumfrey and John Hopkins, but should be pleased to find the others. 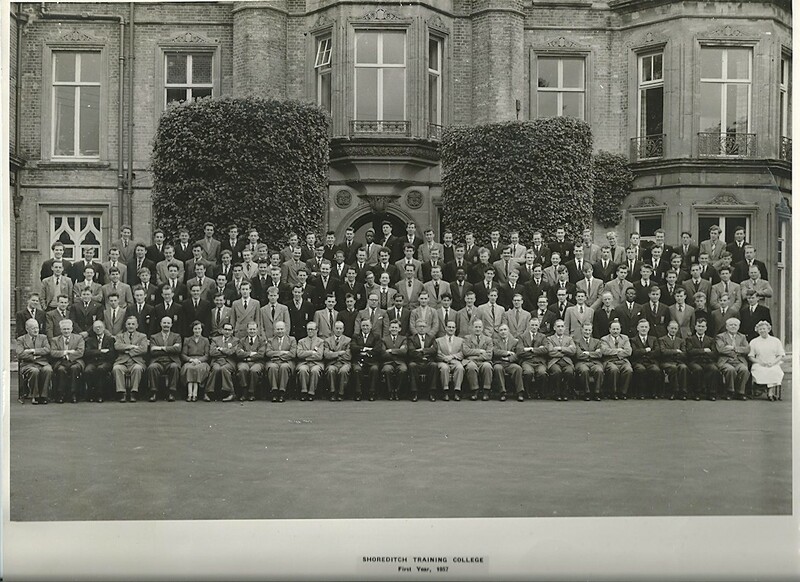 I have a few more pictures of those men shown (and others) at the Windsor range, and some of the Rifle Club Dinner held at (The Packhorse? ), with Mr Clapham and Chris Burrows (president students� union) as our guests. Should be pleased to forward these pictures to any of those who remember those times. UPDATE, March 2017: The two "unknowns", R.M. Slater & D.E. Goddard, have been named for us by Rex Needles (1961). Thanks Maurice and Rex for filling in the gaps. I was at Shoreditch from �68 to �71, just found your website, I would welcome getting in touch with anyone from Reed 300 at that time. I am wishing to contact Mike Davies (from West Wales) who trained with my brother David approx 1960-63. We last spoke about 2004.